When it comes to your theory test practice, it is important to plan your practice sessions and training to become more equipped with learning everything there is to know for your theory test exam. The big day will warrant your hard work and will be evident when you walk out of the theory test centre with a pass certificate. Learner POD has compiled a unique training programme to help with your theory training studies! We have an online theory training course that you can access here. The course consists of video tutorials with real-life footage road footage explaining the many parts of the theory exam. Alongside the course, you will also have access to our member’s area and a safe group to share, discuss and motivational support for your studies. When it comes to your theory test practice, it is really important to make sure you cover all of the aspects of the exam in your training schedule. Missing one section may result in you failing your theory test. It is important to make sure this does NOT happen to you. Learner POD has compiled a comprehensive training online theory course and an abundance of free training material which will help with your theory studies. Hop over to our YouTube channel to access lots of free resources and training videos. 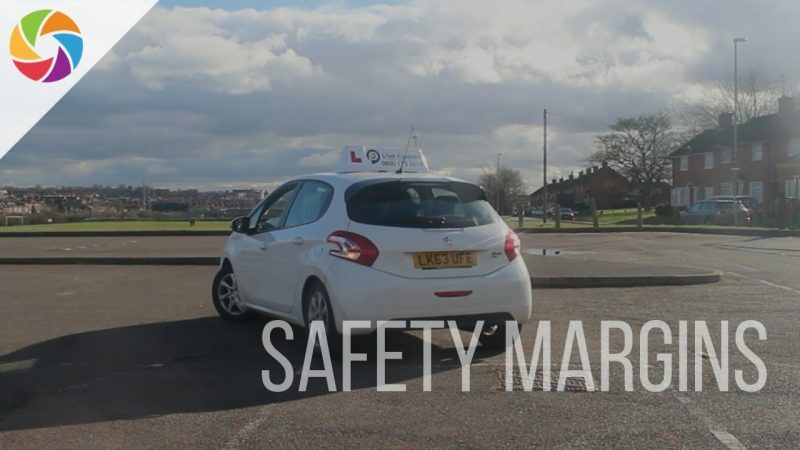 When it comes to training for your theory test, the ‘Saftey Margins’ topic is a lengthy topic and does require a lot of general knowledge on safety margins, stopping distances, contraflow systems and much more. You should plan your studies and prepare for your training using our guide. For a thorough in-depth plan, you can visit our online theory course here. Stopping distances are the ‘overall distances’ given in metric or imperial units (measurements) to quantify the amount of space you will need to stop your car. ‘Overall stopping distances’ is the term given to account for both the ‘thinking’ and the ‘braking’ part of your ‘overall stopping distance’. Nobody is able to react without thinking, so a period of time is needed to see and then respond by braking. For example: at 30 mph, a car ahead of you applies their brake lights. You actually travel (approximately) 9 metres, before you actually start to press the foot brake. It will then take you a further 14 metres to come to a stop! So, the thinking distance and the braking distances are added together – to give you an overall stopping distance. As the overall stopping distance at 30 mph is 23 metres (75 feet). To put this into context: the average car is 4 metres in length, so you would fit 6 car lengths into 23 metres. Therefore, you should always aim to be 6 car lengths behind other vehicles when travelling at 30 mph. The ‘2 second rule’ is the time frame needed for ‘all distances’ regardless of the speed limit you are travelling at. This of course, is based on driving in ‘dry weather conditions’. In dry conditions – the overall stopping distance is 2-seconds. Which means you will need a 2-second gap to be able to stop safely. In wet conditions – the overall stopping distance is doubled! Which means you will need a 4-second gap to be able to stop safely. In icy conditions – the overall stopping distance is 10 x the distance! You will need a 20-second gap to be able to stop safely. When it comes to weather conditions – these can have a major effect on your driving and your safety margins. As a learner or new driver – it is highly unlikely that you would have experienced driving in adverse weather conditions. Don’t break until your steering feels ok again. If you drive through a Ford or a flood, you should test your brakes. This will also help dry your brakes. Press lightly after you have travelled through the water. Allow more time for your journey. Only travel if you really must. If visibility drops below 100 metres (25 car lengths) you should use your fog lights. But, when visibility improves – you should turn them off! If you pass these vehicles, you should be extra careful in case they are blown off course. Be observant and always check your left when you pass them. Stop if your windscreen wipers aren’t clearing your window. Clear it by hand if you need to.